First off, congratulations! Doubtless you have many people giving you advice, ideas and horror stories. Relax, give that baby the coddling it deserves and you will be a great parent. Every baby is different, so ignore the horror stories. Listen to the ideas and advice, but ultimately, when he or she arrives, their personality will be nothing like you'd expected. It is a big responsibility to raise a precious little one. We have everything you need to get you going. 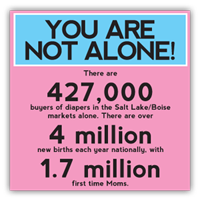 Newborn diapers are small, so they come with larger quantities per pack. Believe it or not, you will need as many as you can get. Maybe you can ask for a pack in lieu of a greeting card! On second thought, for all the work you do as a parent, ask for both-you deserve it. Before baby starts teething, come visit our baby aisle to get your favorite teething toys, sippy cups and baby food. You will notice that we are well-stocked and ready for your newfound needs. Have a question? Ask our knowledgable staff. Once you get into that kind of conversation with us in the aisle, our bet is that a neighboring guest will jump in and offer their own advice! It's a great endeavor you are embarking upon, let us help you do a stellar job. Nothing is more important in the life of an expecting customer than the birth of a new baby. One of the strongest emotional ties is that of a woman and her child. Maybe that is why the baby aisle is a destination for nearly a half a million customers every week. We value you, care about your baby and want to help our newest members of your family get the products they need. Likewise, moms should be treated special and have the opportunity to enjoy their experience on the baby aisle. We recognize that today's mothers are very tech savvy. We have several websites that have helped our families. Want to learn how to cook your own baby food? Click the links below to get some great ideas to help you.